Attuning to the Mother of Oceans – Happy Yemaya Day! Standing at Her shores, I can see Yemaya dancing. The waves are the ruffles of Her skirt as She dips and whirls, sometimes slow and steady and sometimes ferociously, whipping the sea and surf into a frenzy. She has Her moods – don’t we all? 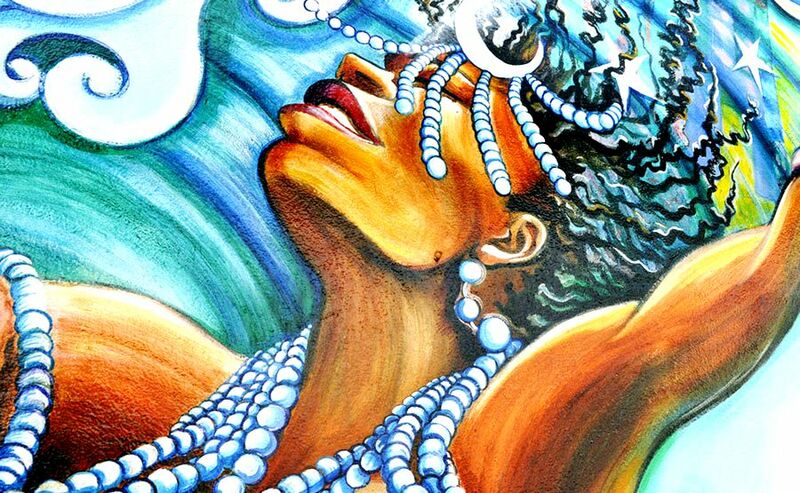 Yemaya is the imposing Mother of Oceans, Orisha, Goddess, All Mother from the Yoruban and Afro-Caribbean traditions. September 7 is Her Feast Day and throughout the world, devotees will be making pilgrimage to Her shores to pay respect, celebrate, and pray. We turn to Yemaya for nourishment, healing, cleansing, and protection. She is stern and implacable at times, but She is also the embrace that we crave. Her soothing whispers sweep through our souls, comforting, nurturing, reassuring. There isn’t a time that the ocean hasn’t been part of my life except for the few years I spent in the desert and mountains. Growing up in Delaware, all weekends and summers were spent at our second home at the Delaware shore. I played in Her surf before I could walk, collected seashells diligently, spent summer nights dreaming and hanging out with friends watching the moon play on Yemaya’s waters. In my 20’s, I moved to South Florida and while the dances of Yemaya were slightly different than the waters of my childhood, I always turned to Her familiar embrace for renewal and cleansing. 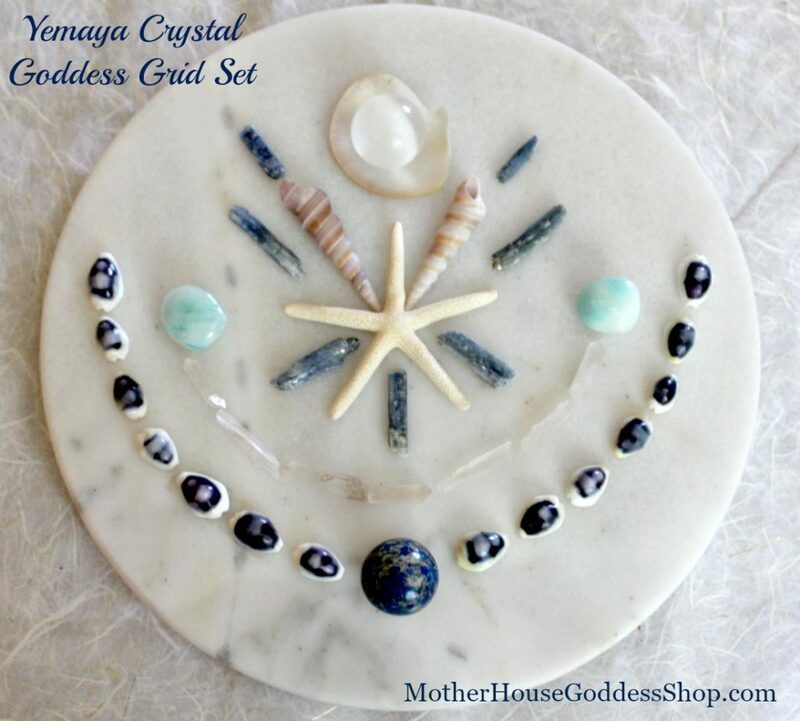 To celebrate Yemaya’s Feast Day this year, I created a Yemaya Crystal Goddess Grid Set and I wanted to share it with all of you. The items included were chosen intuitively, each attuning to Yemaya deeply and empathically. Orishas have very specific likes (and dislikes in some cases) and Yemaya is no exception. Her favorite colors are blue and white and she is frequently depicted as a mermaid. 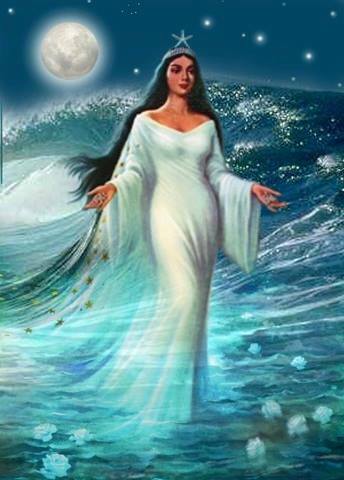 In Santeria, she is syncretized to Our Lady of Regla and she is the guardian of the Bay of Cuba in that form. Saturday is her day of the week and her number is 7. If you are near the ocean, take 7 copper pennies to leave as an offering for Yemaya, particularly if you take something from the beach like rocks or seashells. Found items on the beach are a wonderful addition to an altar for the Mother of Oceans. In some stories, Yemaya births all of the Orishas as well as the Sun and Moon. Her traditional implements include a sword, a fan, a half moon, an anchor, and a silver or white metal sun. 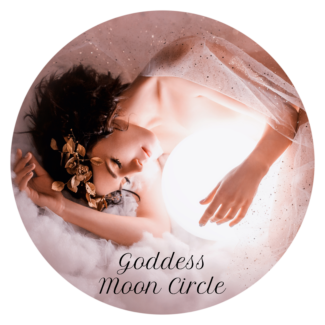 At the top of the Yemaya Goddess Grid is a Selenite sphere which is a lunar stone, representing the moon and tides of Yemaya. Selenite also assists with keeping emotions (water) in balance and facilitates higher connections. 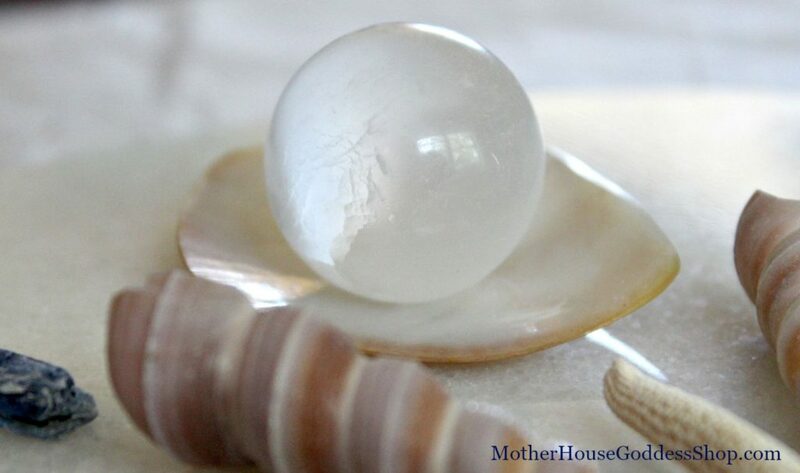 The Selenite sphere sits in a small Mother of Pearl shell that is perfect for an offering dish on an altar. The starfish is a gorgeous centerpiece for the grid. Since starfish can re-grow parts of their limbs, they remind us of the renewal offered by Goddess and Yemaya. Nestled in between the arms of the starfish are Blue Kyanite tongues or shards. Blue Kyanite is a favorite stone of mine and brings powerful energy to enhance meditation, dreams, astral travel, and communication. This stone also brings all of the chakras into alignment when you work with it. The color and properties attune us to Yemaya who really likes to communicate through dreams. The two Spiral Turritella Seashells at the top evoke the swirls of Yemaya’s skirts for me, as well as being divine offerings from Her waters. The two aqua stones on either side are Blue Tumbled Aragonite, another treasure that aligns with Yemaya. Blue Aragonite Crystals are beautiful. The color evokes the clearest blues of the Caribbean which is very apropos for Yemaya! The crystalline structure of Aragonite stores the vibrations of the sea and gives you access to the depths of oceanic wisdom. For those seeking more discipline in their spiritual practices, Aragonite can also help give focus for that purpose. It is a stone that encourages clairaudience while also assisting you in finding your center and the answers within your own mind. Aragonite also has significant calcium content which bring healing energy to those with diseases and health challenges. There are seven tiny quartz points in a half moon shape towards the bottom. These little energy directors provide focus and energy to amplify the grid. Clear Quartz is a transmitter and brings clarity to received messages and energy. At the bottom of the grid, the Lapis Lazuli sphere is surrounded by fourteen cowrie shells. There are over 250 species of cowries and the shell is actually a “house” for a tiny sea creature. There are multiple meanings for cowrie shells and throughout centuries they have been used for decoration, jewelry, fertility practices, and even as money. The fourteen cowrie shells have been added to invite beauty, abundance, and the blessings of Yemaya into your life. Lapis Lazuli is extremely effective when working with the throat chakra, the third eye chakra, and the crown chakra; however, it may also be used to align all the chakras. It has been called the “stone of total awareness” as it improves concentration and focus while also accessing your psychic centers and expanding your consciousness to unite with the Divine realms. Use Lapis to connect further in dreams. The deep blue color soothes and gives relief to emotional turmoil, being especially potent when working with anger and rage stemming from childhood issues, addiction, and abuse – all areas that the presence of Yemaya can be a potent ally. Working with Lapis and the throat chakra also facilitates speaking the truth and honesty in spirit and action. Harmony in relationships and friendships is the vibe when Lapis is focused in this area. 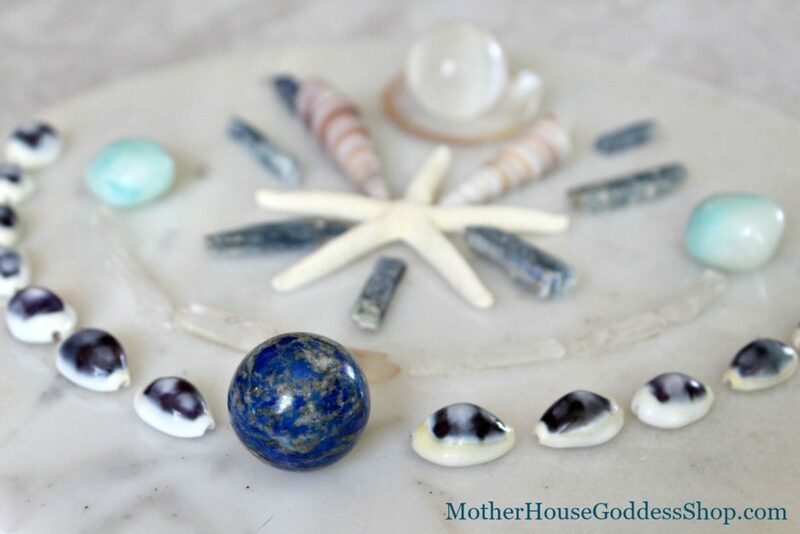 The Yemaya Crystal Goddess Grid Set may be used for meditation, altar adornment, Goddess attunement, or to facilitate achievement of a particular intention. 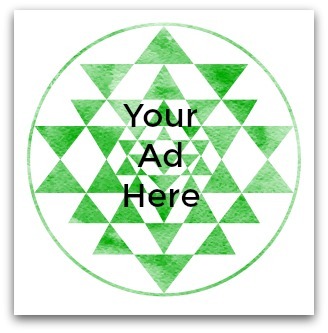 The grid may be re-created as I designed it or in your own intuitive design. Organza bags are also included so that stones may be carried with you throughout your day. Also included, for those interested, is an informational pdf on Yemaya with a Ritual Bath Goddess Practice. 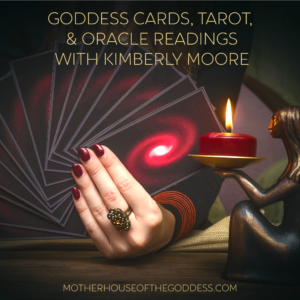 I only have a few of these available, but I also hope to inspire you in creating your own intuitive Goddess Grid for Yemaya or the Goddess that you are working with in practice. These grids can be powerful tools in attuning to Goddess. The Yemaya Grid is available for purchase on Etsy Goddess Shop. Wishing you ALL the blessings of Yemaya today and everyday! I included a few resources below to check out some of the music, dances, and books if you are interested in further exploration. 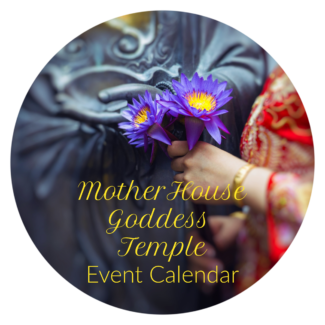 I made a Pinterest board for Goddess and Orisha Yemaya – many of these photos and those on Flickr are pictures of Yemaya rituals around the world. The Goddess Yemaya Essential Oil Blend and Mist was handcrafted by Gwendolyn Barry, the blender and owner for Daughters of Isis. 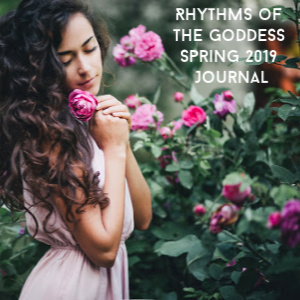 Gwendolyn intuitively connects with the Goddesses to create blends that honor their ancient wisdom and facilitate modern connections. Beginning at the sea with lemongrass, we blend sweet frangipani, champaka, coconut and rose into Yemaya’s fragrance. 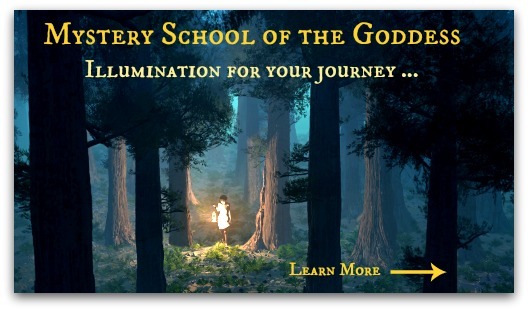 This is a powerful and evocative Goddess Mist that brought me to tears the first time that I experienced it. 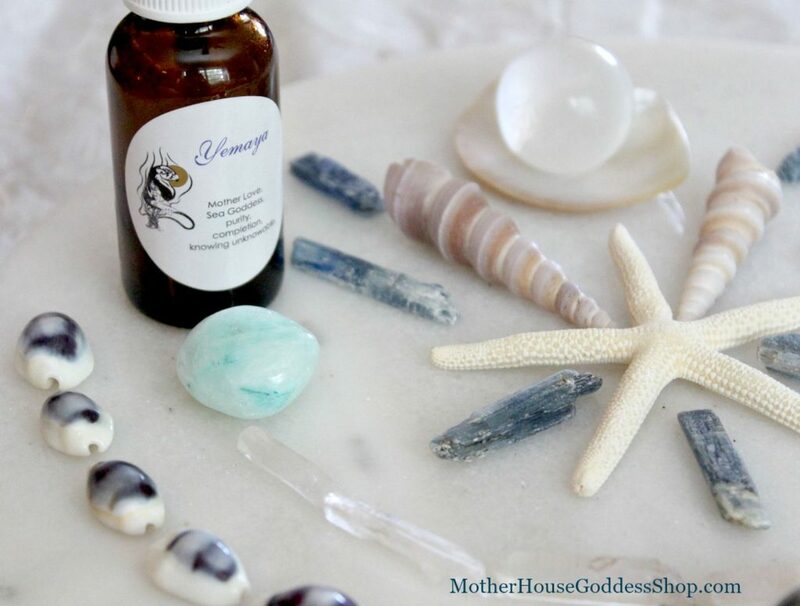 Yemaya Mist may be used to anoint yourself, a candle, a statue, beads, and/or an altar. Inhale the scent to surround yourself with the healing energies of the Mother of Oceans and to immediately transport yourself to the shores of Her divine abode. You may also wear the mist as a perfume for a sensory embrace from Yemaya. Traditionally, Florida Water is the American version of Cologne Water. It is used to anoint and cleanse spaces and brings a refreshing, citrus scent which some may find overpowering. The Florida Waters Essential Oil Mist from Daughters of Isis takes the essence of the original Florida Water and combines neroli, sweet orange, tangerine, nutmeg, ambrette seed & amyris essential oils for a blend that is intoxicating, uplifting, and cleansing. The YAYA Queens dance in your space whenever this is sprayed and clear the way for new energies and potential! You may wear the mist like a perfume or use it to cleanse your space and altar. Also available as a soap from Daughters of Isis. **Note – in Candomble practices, they celebrate Yemaya Day on February 2 which is the Lukumi and Santeria Feast Day for Oya. Thank you for the wonderful information and showing us the beautiful grid for Yemaya!! I’m celebrating her feast day today! My gifts will be a watermelon filled with coconut rum, and seven pennies 🙂 I love working with Yemaya.